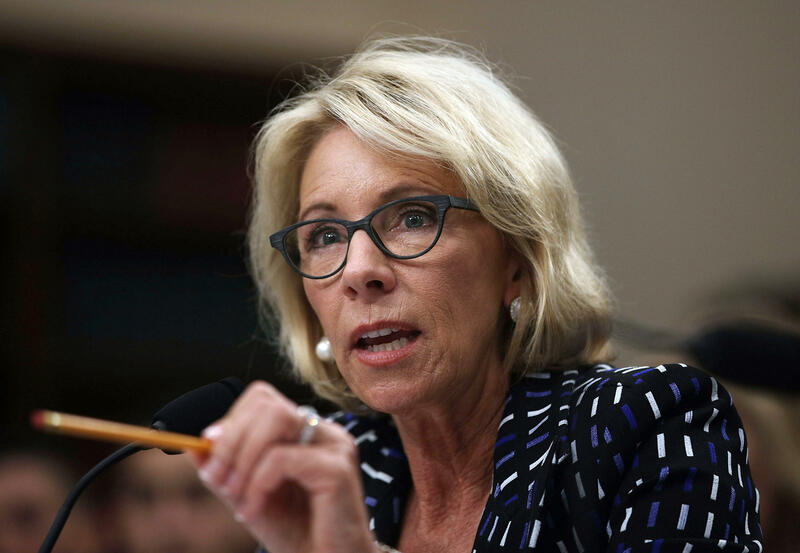 WASHINGTON -- Education Secretary Betsy DeVos on Friday scrapped Obama-era guidance on investigating campus sexual assault, replacing it with new interim instructions allowing universities to decide which standard of evidence to use when handling complaints. DeVos has said that Obama's policy had been unfairly skewed against those accused of assault and had "weaponized" the Education Department to "work against schools and against students." "This interim guidance will help schools as they work to combat sexual misconduct and will treat all students fairly," DeVos said in a statement. "Schools must continue to confront these horrific crimes and behaviors head-on. There will be no more sweeping them under the rug. But the process also must be fair and impartial, giving everyone more confidence in its outcomes," she said. Andrew Miltenberg, a New York lawyer who represents students accused of sexual assault, described Obama's standard as only "50.1 percent certain" and said that it ignored the presumption of innocence and put the burden on the accused to prove that the assault did not happen. Miltenberg said the system proposed by DeVos is much more fair. "Certainly, it's a much more stringent standard and one that is less open to subjective interpretation," Miltenberg said. Earlier this month, Devos told CBS News' Jan Crawford that the Trump administration intended to rescind Obama's guidance and "move towards a better way." "I've said earlier, in all of this discussion, it really is a process, not an event," she said. "But it is the intention to move beyond that and move towards a better way." A student may choose whether to report a claim of assault to police or to have it investigated by a university under a federal provision against sexual discrimination. Many students choose not to turn to law enforcement because many such cases go unprosecuted as police and the courts require higher standards of evidence. Also, many victims are traumatized and may feel more comfortable to deal with university investigators rather than with police. The Education Department's Office for Civil Rights is currently investigating 360 sexual violence cases under investigation at 258 postsecondary institutions. The Department said that any agreements have already been reached with schools as part of investigations that have already been completed will stay in place, while continuing investigations may be reevaluated. Women's rights advocates lashed out at the decision. Fatima Goss Graves, president and CEO of the National Women's Law Center, said her organization was "deeply disappointed" by the announcement. "We believe that this guidance will create confusion for schools and stands to penalize survivors and we think this sort of guidance will take us back to a time when sexual violence was routinely swept under the rug," Graves told CBS News. She added, "Title IX is steeped in equality so you have a standard that treats people equally."